Exercising your knees safely can be one way of helping arthritis pain. Learn what types of exercise equipment are best for your arthritic knees, so you can reduce your pain and use your knees without worry. Because running and jumping may cause pain, doctors frequently recommend a low-impact workout for those with arthritis. Choose a piece of athletic equipment that can give you a good aerobic workout without stressing your knees. Stationary bikes, both recumbent and upright, are excellent pieces of equipment for people with arthritis in their knees. They work the lower body without impact. Depending on which version you use, they also require little to no weight bearing on your knees, which can help relieve some stress. Make sure when you select a bike that allows you to adjust the seat. You should be able to easily reach the pedals with your leg extended in front of you and your foot flexed. Consider selecting a bike like that has lumber support and multiple levels of resistance for the most comfortable, customized workout. Depending upon the way in which your knee tracks, you may find that the elliptical is perfect for your knees. This low-impact exercise has a more limited range of motion in the knee joint, which can help keep your knees moving fluidly. Elliptical machines are also weight bearing, which can help you develop stronger bones around the knees to help support them. 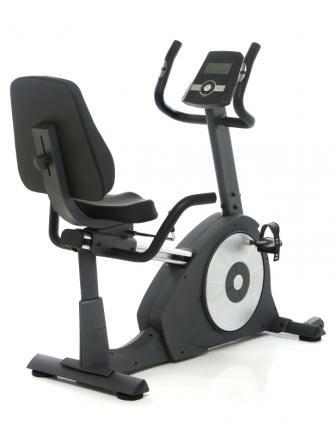 Choose an elliptical like the Smooth CE 7.4, which has a long, 21-inch stride. This may be more comfortable for those with problem knees. If you find, however, that your knees turn inward as you pedal, and this in turn causes you pain, you may want to avoid using the elliptical machine. While running is not recommended for arthritic knees, walking can be a useful aerobic exercise for people with arthritis. Treadmills offer more cushion than hard pavement, and gentle inclines can help make the workout more challenging without being strenuous. Start slowly, walking for five to 10 minutes at a time, as you build up strength and stamina. Use a walking treadmill like the Exerpeutic 350 at home for a comfortable indoor walk. The best exercise programs are the ones that incorporate strength training with aerobic exercise to help strengthen the muscles around the knee joints. This can help keep the knees tracking properly and expand and preserve your range of motion. A machine weight leg press can help to strengthen the entire leg, without fear that you will go too far and injure your knees. 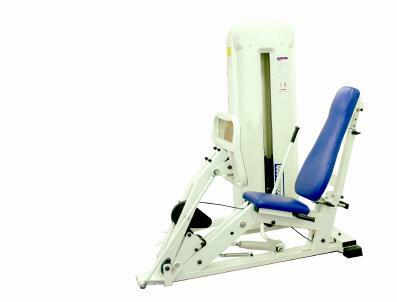 Set the machine's weight plate within your knees' comfortable range of motion and begin with a light weight. Build up slowly as you gain strength. 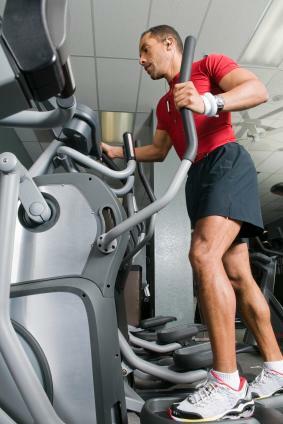 Use a machine like the Cybex leg press, which allows you to adjust your upper body position to a comfortable incline. Ankle weights are a great way to gain strength without stressing the knee joint. Lay on your side with the weight on the top ankle. Keep your leg straight as you lift it from the hip. This will strengthen the muscles on the sides of the leg, which can help keep your knee tracking while not stressing it. Get adjustable ankle weights like those made by Valeo to keep increasing your strength over time. Resistance bands can help you strengthen all the muscles in your leg without stressing the knee joint. Loop the band around both feet at once and either stand on one leg while moving the other out to the side, front or back, or sit on a chair and bend one leg out in front of you while the other remains on the ground. The resistance band will add light pressure, making your muscles work harder. Use simple bands like those made by Versa, which are designed to fit the upper or lower leg. The third component of exercising your arthritic knees is doing range of motion exercises. Range of motion exercises help keep your joints moving properly by stretching and strengthening the areas around them. Yoga is one of the most recommended exercises for range of motion, and it can be done with a simple mat. Select a mat this is sticky enough to help you keep your balance and thick enough to offer some support to your knees when you are down on the floor. 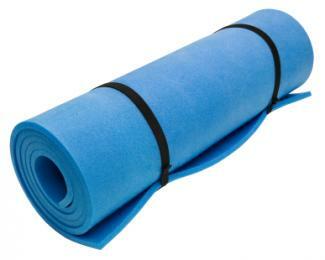 Look for a mat that is at least 5mm thick, like those by Gaiam, to get the best support for your knees. As you work to become more flexible, a cotton strap can help you achieve exercises and positions you may not be able to do at first. You can wrap cotton strap around the soles of your feet to help you bend forward further, or you can use it to support one leg in the air, giving you some stability. Use a simple D-ring strap to quickly thread your strap into a loop. No matter what exercise equipment you choose to use for your arthritic knees, make sure you begin slowly and check with your doctor to see which exercises may help you the most. There are different types of arthritis, and some may benefit from one exercise more than another. Choose the best pieces of equipment for your knees to reap all the benefits that exercise has to offer.